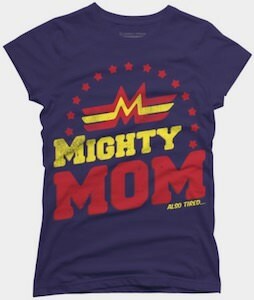 If you want to surprise you mom with an amazing superhero themed shirt then you have to get her this mighty mom t-shirt. The t-shirt is available in a couple of different styles and many sizes and colors. On the t-shirt, you can see starts and a superhero logo that looks like a nice M from mom and below that, in big letters, it says “Mighty Mom” and below that in tiny letters “also tired…”. The t-shirt has a worn look which adds to the being a superhero part. A mighty mom t-shirt makes for the perfect gift for mothers day, birthday, or any other reason you can find to make you mom happy.